This post is a collection of tricks I struggled to learn in my first several hours with this ereader. 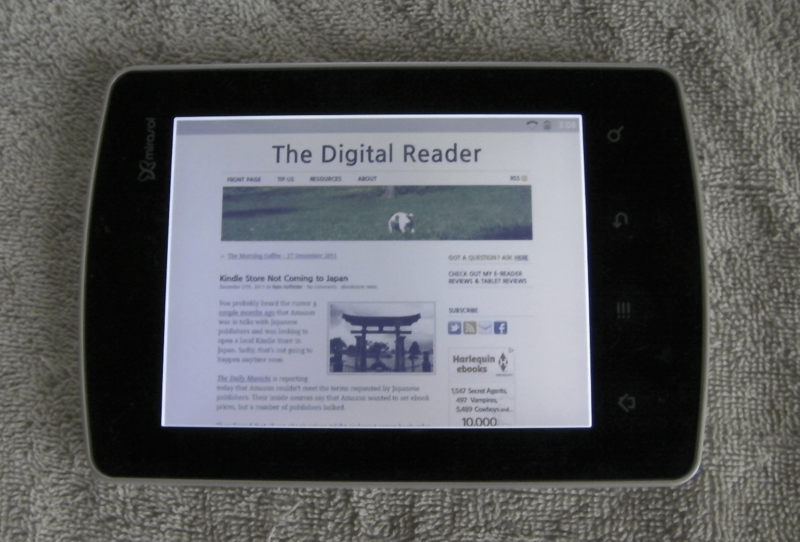 The Kyobo Mirasol eReader was released on the Korean market, and it is not easy to use if you do not know Korean. I'm hoping that this post will save others the aggravation and frustration I experienced. First let me cover accessories you'll need to buy. If you want to add your own ebooks you will need a microSD card installed in the ereader. This is not optional; you cannot load your own ebooks without one. The charger is not quite as necessary; I charge off my computer. But you do need to know that the charger that this ebook reader ships with comes with a plug that will not work in US sockets. The power supply has a plug that slides off and reveals a US standard plug. Before you do anything, you'll need to make some folders on the microSD card. Make a folder called Kyobo. Inside that folder make another called Import. That's where you will need to copy your ebooks so you can load them on to this ebook reader. You can do it now, and then insert the microSD card into your unit. I've just picked up another tip. If your device freezes, you can force a reboot. Press and hold the power button and up volume button for 5 seconds. Then try to turn it on again. The Kyobo Mirasol eReader runs Android, and like any Android device it has a lock screen that you will see when you wake up the device. You can exit this lock screen by double tapping the green button. Kyobo's library and reading app will only display Korean characters in their menus, but you can switch the underlying Android menus to English. From the Home screen, press the menu button (second from the left, below the screen). A row of icons will appear at the bottom of the screen. Scroll them to the left until you can see the very last icon on the right. That's the settings menu. Open it. Scroll down to the bottom of the settings menu. The third option up from the bottom is the language menu. Press it. In that menu, select the top option. Then select English. I'm not sure yet if you can install apps, but I do know that downloads are blocked. You cannot even download an Epub ebook. Go back to the home screen. In the upper right corner are a pair of buttons (as well as a third button with a gear). The pair of buttons let you select between 2 type of home screen menus. Don't touch the one with the 4 squares; you're already using it. Select the other one. After the screen changes, you will find a pull out menu along the left edge of the screen. Open it. Press the button that says MyBook. If all goes well, that should have caused your ebooks to be imported from the Import folder. You should see them as a list on the right side of the screen. Now you can read them. Yes, the above did take me a couple hours to figure out (I was also working at the time). I tried many ways to load the ebooks before I looked through the user manual. It's in Korean, but there were enough images that I was eventually able to guess what I was supposed to do. P.S. If you need help with something, please ask. I've just started using this gadget, and I'd love to help my fellow owners. P.P.S. If you know of a trick that I didn't mention, please add it in the comments. How did you get it and how much was it? That screen sure looks…antiquated. Hope the next version ditches that frontlight. Or someone should take it apart and remove it – see how good or better it would be. You can turn the frontlight off. But it looks worse. You can check out the user review I linked to above to see what it looks like. Good god. Just realized that’s more than a Samsung Galaxy Tab 7 Plus. $430? Is that total with shipping? Yes, and they shipped it Express Int’l. How does it handle your DRM epubs? It doesn’t I cannot get Adobe DE to recognize that I’ve plugged in a device. Kind of limits its usefulness as a reader. If you ever do a review, I would be curious about how the screen compares to black and white e-ink (like whether it has a better contrast, and how the refresh compares). So far I’m pretty shocked about how underpowered this device is, since it’s so expensive. Nate, I commented a while back on your post–to use my own words–Mirasol release date set, big whoop, it’s too late to matter. I talked about how I really find the technology interesting, and discussed the niche for which it has potential appeal–a compromise, for those wanting only one device; one which has some of the attractive features of both e readers and tablets, despite some caveats (lack of brilliant display, cost). I also noted the possibility of a Mirasol device tailored to the education market–is there a PocketBook model in the cards for the Russian edu sector, I wonder? –and, the utility of a Mirasol display in future smartphones. These considerations in mind, what do you think of a Samsung Galaxy Note-like device using the 5.7″ mirasol display–both as far as marketability, and potential for some company to pick up the ball, and run with it? Also, I noted the absence of mention of the Note on this site–wondering if that is intentional, and if you’d care to comment on the Note, now? (regardless of the related issues raised by a Mirasol enabled twin). Thanks. Are you talking about the Asus eeeNote? I have mentioned it once or twice, but you are correct in that I never reviewed it. For a while during the summer the eeeNote was going to be sold in the US. That got me all excited and I planned to get one as soon as I could. Then Asus changed their mind and I never got around to getting one. I’d actually forgotten that I had planned to. And as for Pocketbook, so far as I know they want to make a Mirasol device. But they cannot because there aren’t enough screens. Nate, no not the Asus eeeNote. I’m speaking of the Samsung smartphone/ tablet hybrid, with a brilliant–and, eye-straining, battery munching, sunlight invisible–5.3″, 1280 x 800, HD, AMOLED display–running Android 2.3 Gingerbread with a 1.4 GHz dual core processor. The hybrid is barely larger than the screen itself, making it large for a smartphone, but not unwieldy w/ bluetooth connectivity (fits in a pocket)–far more portable than an iPad, for example! Oh, that. It’s nice, but it’s a little outside my price range. Just wondering if you have any thoughts on that format–small display/ form factor, phone included; and, Mirasol version prospects–in theory, and in the flesh? Also, what is your opinion of the likelihood of significant improvements in the Mirasol display–outside of manufacturing issues/ problems for QCOM–as far as, color saturation, white whites, black blacks, brilliance, video, down the road? Well, I like the small size. Ever since I gave away my iPod Touch I have regretted it. But I’ve never liked smartphones as a whole. I’ve always wondered if the manufacturers conspired with the major networks to keep prices artificially high so the networks can lock customers into contracts. Nate, thanks for the expression of your impression of the smartphone/ tablet hybrid concept. My personal take, for whatever it’s worth, is slightly complicated, but I will try to be brief (I sometimes treat blog posts as if they are term papers, please excuse). I’ve never been a fan of smartphones myself, in part because I spend enough time on the computer at home, why carry a mini one around, if getting out of the house is a vacation of sorts from be wired/ chained to the web? But, I’m realizing that these days it’s as imperative to be available online 24/7, as it is to have a car in the burbs–possible to do without, but hardly practical. In biting the bullet and going mobile, a concomitant issue arises for me, which I’ve alluded to in earlier posts; that is, the pragmatics of having a one size fits all device, rather than three dedicated devices–phone, tablet, ereader. A large smartphone, steps close to the threshold of my comfort zone, as far as a unit that is carried with me everywhere I go, but it is a sacrifice which I am willing to bear, if it can wear several hats; it’s small for a tablet–but, that can be seen as an advantage, as per above–why be avail yourself of a web, which has tremendous utility, but can alternately be a prison, depending upon whether at any given moment you are spider or its victim, ie computers were invented to save time, yet they can be the biggest time wasters around. Lastly, a Mirasol phone/ tab hybrid would make a great ereader ( paperback in stature) as well, and it would enable the phone to be daylight visible, and the whole affair a thrifty consumer of power. It would be my ideal device, and I’d pay a hefty sum for one, were it to come to market, but maybe I’m dreaming–wake me up, if that’s the case. Thanks for reading. Always a pleasure reading in digital form the digital reader! I hope your full review is coming shortly. I’ve only had it since Tuesday. I think you’re expecting a little much. Sorry,I didn’t mean to sound demanding. You can buy it USD 375.99 including Express shipping charge. SD card is not included. Manual is Korean. Did you ever discover whether you can install apps? It’s possible to hack it, yes. But I can’t get the drivers to install on my PC. Nate, have you had any trouble with getting it to recognize books on the microSD card? The first time I put some in an Import folder it worked just fine. However, after I added more books to the card it just kept giving me the original list. I’ve added books a couple times with no trouble. I can’t get it to list anymore than the 2 books I first loaded on the card, even after deleting everything on the card and recreating the Import directory. There must be some sort of refresh in the book menu but I can’t find it. Any idea how to do a reset? I tried for hours in rooting the kyobo without succsess. Is there a good tutorial awailble how to work it? i would be very thankful for your answer. @Joe: did you have any luck with your Kyobo Mirasol?